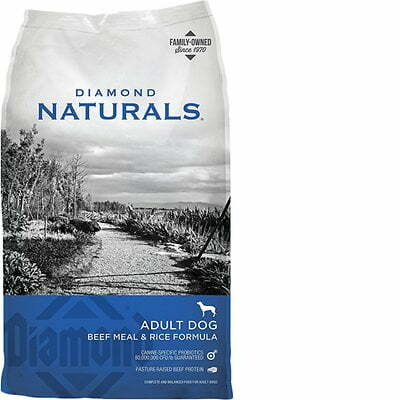 Diamond Naturals Beef Meal & Rice Formula is a low-priced dry dog food with good quality. This product has includes no controversial ingredients like artificial preservatives, colors and flavors. However, the food has a high amount of carbs but excellent meat and fat quality. Diamond has an above-average number of dog food recalls. The company, however, was extremely transparent when answering our questions. Watchdog Labs recommends this product. This food has a fair amount of protein but is high in carbs, which is lowering the fat content slightly and making it less nutritionally balanced compared to other dog foods we evaluated. Carbohydrates are cheap so they keep the food’s cost low. They are nutritionally useful to dogs in the right amounts, however, high amounts of carbs can reduce the much-needed meat-based protein and fat content. Beef Meal, Peas, Ground White Rice, Egg Product, Dried Yeast, Rice Bran, Chicken Fat (Preserved With Mixed Tocopherols), Pea Flour, Dried Beet Pulp, Natural Flavor, Flaxseed, Potassium Chloride, Salt, Dl-Methionine, Choline Chloride, Taurine, Dried Chicory Root, Kale, Chia Seed, Pumpkin, Blueberries, Oranges, Quinoa, Dried Kelp, Coconut, Spinach, Carrots, Papaya, Yucca Schidigera Extract, Dried Lactobacillus Plantarum Fermentation Product, Dried Bacillus Subtilis Fermentation Product, Dried Lactobacillus Acidophilus Fermentation Product, Dried Enterococcus Faecium Fermentation Product, Dried Bifidobacterium Animalis Fermentation Product, Vitamin E Supplement, Beta Carotene, Iron Proteinate, Zinc Proteinate, Copper Proteinate, Ferrous Sulfate, Zinc Sulfate, Copper sulfate, Potassium Iodide, Thiamine Mononitrate (Vitamin B1), Manganese Proteinate, Manganous Oxide, Ascorbic Acid, Vitamin A Supplement, Biotin, Niacin, Calcium Pantothenate, Manganese Sulfate, Sodium Selenite, Pyridoxine Hydrochloride (Vitamin B6), Vitamin B12 Supplement, Riboflavin (Vitamin B2), Vitamin D Supplement, Folic Acid. The average dog food we reviewed has 39 total ingredients, with 1 controversial ingredient. This recipe does not include any controversial ingredients. Beef meal is dehydrated whole muscle from cattle. Meat meals are the result of cooking. Water is removed from meats to create a protein-rich meal powder. Meat meals contain about four times the protein meats do, so generally, they're a good source of nutrients. Beef meal is generally a healthy dog food ingredient. White rice is regular rice that is milled to remove parts of the grain, including the husk, bran, and germ. This changes the flavor, texture and appearance of the rice and also extends its storage life. It provides calories, complex carbohydrates and a few other nutrients to dogs. However, because important parts of the grain have been removed, white rice offers lower protein and other nutrients than whole grain rice or brown rice. Therefore, we do not consider it a high-quality dog food ingredient. Egg Product are shell-free eggs that have had their moisture removed. While it provides nutrients like protein, it can be made from food-industry waste products such as eggs that failed to hatch. In other words, quality can vary. Because there are better protein sources (like whole eggs or meat) we do not consider this a high-quality dog food ingredient. Yeasts are single-celled microorganisms. While commonly used, there is not yet enough scientific evidence for or against yeast as a dog food ingredient. No controversial ingredients in this food. Diamond makes its products in the USA. This product uses clearly named proteins such as beef meal, and egg product. This is great because it shows us exactly which animal these ingredients come from. In addition there are a number of named fats like chicken fat, flaxseed, and chia seed. Again, all naming the source and indicating they are a quality ingredient. This product contains 0 controversial preservatives. Artificial preservatives are not always bad since they prevent food from spoiling. However, there are 11 specific artificial preservatives that have been linked to cancer and other serious health conditions. We consider those to be the controversial ones. Diamond has not included artificial colors in this product. There are no artificial color either. This brand has an above-average number of food recalls. 6 lb. and 18 lb. bags plus sample sizes of Diamond Naturals Small Breed Adult Dog Lamb & Rice Formula, with Production Code #DSL0801 and the following “Best By” dates: Oct. 20, 2012, Aug. 26, 2012, Sept. 27, 2012, Oct. 8, 2012. All varieties and sizes of both Diamond and Diamond Naturals pet foods were recalled in this large expansion of the previous recall (April 2012), but only those products manufactured in the company’s Gaston, South Carolina, facility, noted in the Production Code number with a “2” or “3” in the 9th position AND an “X” in the 10th or 11th position, and only those with “Best Before” dates falling between Dec. 9, 2012 and April 7, 2013. The following Diamond dry dog foods were among those pulled from shelves (this recall was later greatly expanded in May 2012): Diamond Naturals Lamb & Rice, 6 lb., Production Code #DLR0101D3XALW, Best Before 4-Jan-2013, Diamond Naturals Lamb & Rice, 20 lb., Production Code #DLR0101C31XAG, Best Before 3-Jan-2013, Diamond Naturals Lamb & Rice, 40 lb., Production Code #DLR0101C31XMF, Best Before 3-Jan-2013, Diamond Naturals Lamb & Rice, 40 lb., Production Code #DLR0101C31XAG, Best Before 3-Jan-2013, Diamond Naturals Lamb & Rice, 40 lb., Production Code #DLR0101D32XMS, Best Before 4-Jan-2013, Diamond Puppy Formula, 40 lb., Production Code #DPP0401B22XJW, Best Before 6-Apr-2013, Diamond Puppy Formula, 40 lb., Production Code #DPP0401A21XAW, Best Before 6-Apr-2013, Diamond Puppy Formula, 40 lb., Production Code #DPP0101C31XME, Best Before 11-Jan-2013, Diamond Puppy Formula, 40 lb., Production Code #DPP0401B21XDJ, Best Before 7-Apr-2013, Diamond Puppy Formula, 20 lb., Production Code #DPP0401B22XJW, Best Before 6-Apr-2013, Diamond Puppy Formula, 20 lb., Production Code #DPP0101C31XME, Best Before 11-Jan-2013, Diamond Puppy Formula, 20 lb., Production Code #DPP0101C31XRB, Best Before 11-Jan-2013, Diamond Puppy Formula, 8 lb., Production Code #DPP0401B2XALW, Best Before 7-Apr-2013, Diamond Puppy Formula, 6 oz. samples, Production Code #DPP0401 (no date given). The following products from the company’s Gaston, South Carolina, manufacturing facility, noted with a capital “G” in the 11th or 12th character in the date code, and only those with “Best by” dates falling between March 1, 2007 and June 11, 2007: Diamond Low Fat Dog Food, Diamond Hi-Energy Dog Food, Diamond Maintenance Dog Food, Diamond Performance Dog Food, Diamond Premium Adult Dog Food, Diamond Puppy Food, Diamond Maintenance Cat Food, Diamond Professional Cat Food. Diamond responded in the first day to our email. They left a few questions unanswered, but quickly resolved them with the follow-up email. We use a team approach for veterinary and pet nutrition. The team is comprised of staff members as well as outside consultants. Dr. Alexia Heldman is the staff veterinarian while Dr. Melissa Brookshire and her veterinary team provide regular consultation. In addition, Dr. George Fahey, a prominent nutritionist, provides nutritional consultation on an ongoing basis. Mark Brinkmann has been formulating recipes for Diamond Pet Foods since 1995, and trained under Mark Morris, the founder of Hill's Science Diet. All of our products are formulated to meet the nutrient levels established by AAFCO. With regard to the AAFCO 6-month feeding trials, we do use them from time to time, but only on a limited basis. We believe that these tests can be overstated in their value. The AAFCO test protocol only requires 8 dogs be in the study, and most research facilities use only beagles. In our view, that protocol by itself does not constitute a robust assurance of nutritional adequacy. In fact, it is possible to pass an AAFCO feeding trial with nutrient values that fall below the AAFCO Nutrient Profile requirements. We believe strongly in the value of the AAFCO Nutrient Profiles. These profiles were developed by some of the best pet nutritionists and veterinarians in the world and were updated in 2016 to reflect new nutritional information available. These profiles are comprehensive lists of required nutritional values, the span of which includes Amino Acids, Vitamins, Minerals, and Fatty Acids. Validating our adherence to these requirements is the path we use most often to ensure nutritional adequacy. It is our view that meeting and exceeding these requirements assures that our foods are nutritionally adequate for the pets that we are feeding. We have five manufacturing facilities, all located in the United States – two in California, one in Missouri, one in Arkansas and one in South Carolina. Please visit our corporate website, http://diamondpetcompany.com/#facilities/1 for a virtual tour of our state-of-the-art facilities to get an inside look at what it takes to create quality products. Due to safety regulations and to ensure that our quality control protocols are followed, tours of our facility are limited to the virtual tour on our website. Mycotoxins are toxic chemicals produced by fungi that can occasionally appear in grains. Therefore, no grain ingredients are allowed to enter our facilities without having been thoroughly analyzed. Additionally, we test all finished products prior to release. We conduct over 1,300 microbiological tests every week. All topical palatants and probiotics must have a Certificate of Analysis and prove to be Salmonella-negative before submission to our facilities. Our reverse osmosis water purification process ensures the water we use is free from microorganisms and any possible contaminants. All facilities are segregated into zones to ensure separation of raw materials from finished products and equipped with HEPA®-filtered and ozone air-treated handling units. No product is released into distribution without adhering to the strict standards of our Test and Hold Program, in which product tests are conducted by a certified, independent laboratory. Diamond Pet Foods does own our five manufacturing facilities.